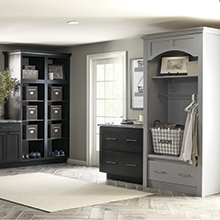 As homeowners decide to stay in one home for a longer period of time, many of them are choosing neutral cabinet colors for their ability to work well with a variety of design elements. Seamlessly blending with the rest of the house, these new earthy, neutral color palettes create a visual warmth in any space. 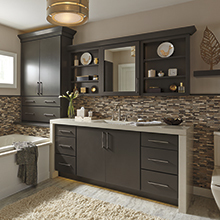 Mineral tones evoking graphite, ore and slate bring a sense of strength and depth to kitchens and baths. 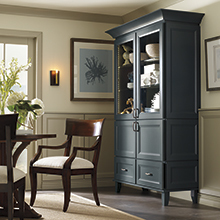 She's unmatchable in her flair for color, and today's cabinet color trends reflect her lasting sense of style. Kitchen and bath color palettes created to reflect Mother Nature's best, from variations of fresh foliage green to the colors of golden wheat fields. To evoke a natural calm in interior spaces, use atmospheric cabinet colors and finishes influenced by clouds, fog or mist. Striking color blocks in combinations of bold, classic colors will create a sense of luxury in a space. Icy white and lustrous black; stand-out red and creamy camel; ageless navy and deep chesterfield green. Color blocking created with contrasting cabinetry colors is one way to achieve this look of luxury. Color goes to a deeper level than ever before, laying a solid foundation for a great range of palettes for kitchens and baths alike. Blues get deeper with inky-black and indigo influences. Classic grays intensify. Rich chestnut undertones create bolder browns. Dark monochrome designs occur in kitchen cabinets with dark, deep finishes and baths with glossy black surfaces. 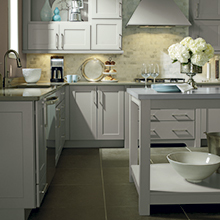 Gray cabinets have become increasingly sought after, bringing an air of chic sophistication to kitchens and baths. 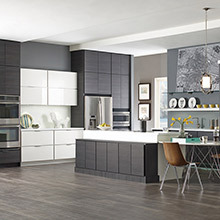 A versatile neutral, gray highlights the desire for sleek and simple cabinet door styles without drawing attention away from the rest of the room. 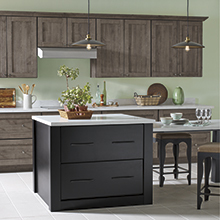 Lighter gray cabinets used with deep, mineral-tone gray cabinets add cool contrast. White cabinets create design flexibility to last over time while showing the desire for serenity in the home environment. 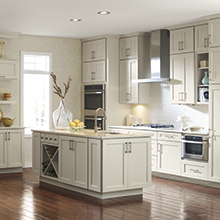 To provide an optimistic contrast to deep neutrals, homeowners are choosing off-white or white cabinets. Blues soothe the soul, working well the neutral palette in kitchens and baths. Pale, spa blues and light colors of the sky and water make an attractive complement to cabinets that have a raw wood finish, creating a relaxing and comforting air.